The working life of a typical adult is getting tougher by the day. In addition, the demands of the workplace are compounded by new challenges under mitigating circumstances. We are currently living in an environment that is constantly changing. Organizations and professionals need to transform the way they operate. The last 50 years have seen Singapore’s meteoric rise from a basic manufacturing base to a world-class financial centre and service economy. The challenges for the next 50 years will be different. As the economy transforms itself, new skills and jobs are needed. To keep up with the job demands of the future, equipping oneself with various skills is key. The Singapore campus of James Cook University offers a new series of masterclasses for individuals to stay competitive in the global marketplace. James Cook University (JCU) is Australia’s leading university for the tropics. Offering excellence in teaching and research, JCU is a vibrant university operating across two countries and three tropical campuses, with locations in the North Queensland cities of Cairns and Townsville and in the city-state of Singapore. SkillsFuture aims to encourage individual ownership of skills development and lifelong learning through knowledge, application and experience. SkillsFuture Credit aims to encourage individuals to take ownership of their skills development and lifelong learning. 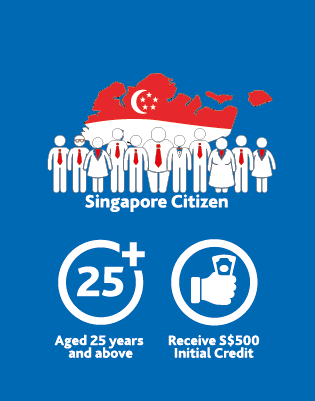 All Singaporeans aged 25 and above will receive an opening credit of S$500. The credit will not expire and the government will provide periodic top-ups, so one may accumulate his/her credit.